Two of my grandsons absolutely LOVE to eat bananas! If they were allowed to, they would eat them all day long! They are both definitely bananas about bananas! When I saw this banana cookie cutter, I knew it would make the perfect valentine treat to go along with the banana saying. 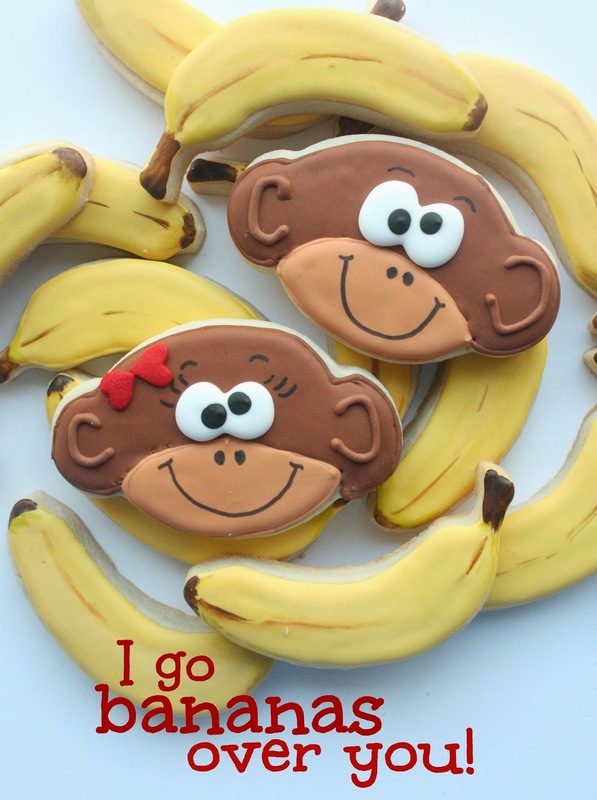 I cannot tell you how much fun it was for me to decorate the banana cookies. I tried to achieve the correct shade of yellow for the bananas and think I came pretty close. For the markings, I painted (gel food coloring) on some brown, and a little bit of green at the top and bottom of each, but it's difficult to see the green in the photos. I enjoyed it so much, that I think it's safe to say that I am bananas over these bananas! I hope the grandkids are too! 1. 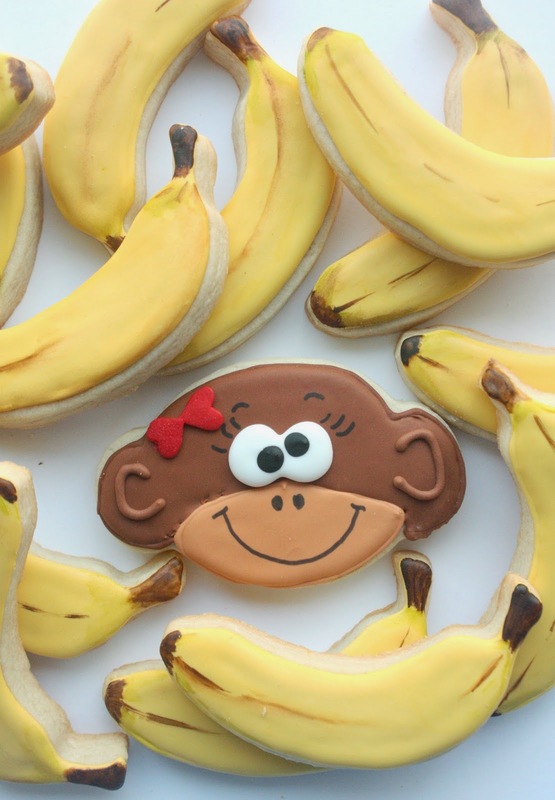 Bake monkey shaped sugar cookies; let cool. 2. With tinted chocolate brown royal icing, outline and fill the top half of the monkey's head. Let dry for about 20 minutes. 3. Using the warm chocolate royal icing, outline and fill the bottom part (muzzle?) of the monkey's head. Let dry. 4. Add the ear detail with the chocolate brown. 6. Let cookies dry completely before adding the facial details with the food marker. 7. For the girl, use a bit of royal icing to the back of the jumbo heart sprinkles and place on monkey's head to form a bow. 1. Bake banana shaped sugar cookies; let cool. 2. Tint plain (white) royal icing with golden yellow and gold until you achieve the desired banana shade, and outline and fill the entire banana. 3. Let cookies dry completely. 4. Using a small paint brush (reserved for food), paint the brown markings on the bananas with the chocolate brown food gel (have a small bowl of water handy to dilute/and rinse off the brush if needed, and also a paper towel to dab the brush of excess gel/water). 5. With the paint brush and the electric green gel paste, add some green shading to the base of the top stem and just above the bottom, other dark end). I think you nailed the yellow! What a fun set of Valentine's Cookies for your grandsons! I know they are going to go "wild" for them! Thanks, Lisa! Happy Valentine's Day to you too! Gosh..those 'bananas' look so REAL and perfect. I totally thought those were real bananas until I looked closer! i thought those monkeys were real when i looked at these cookies! dang see how good you are? and i'm sure you could turn those bananas into cookies too! YOU had me fooled, Lisa, with your monkeying around! :) Thanks for commenting! They are perfect, Sue! I just can't get over how real your bananas are. Thanks, Paulette S.
Thanks for your comment, Paulette! I can relate to your technical difficulties; it can be so frustrating! Ugh. Hope it gets cleared up! These couldn't be more cute!!!! They're too cute too eat. Oh my goodness! You just slay me time and time again! I am in love. We did sock monkey pjs this year for Christmas - adult sizes!! Thee would have been hysterical to serve along with!! Haha, sock monkey pj's sound like so much fun! Thanks for your comment, Jackie! The bananas look really realistic! I love the way you painted them! I don't know what I love more this sweet story or the adorable cookies. What a great way to be inspired to make something creative. You are a true artist Sue! Have you ever painted on canvas?